RollerCoaster Tycoon 3 Game Review - Download and Play Free Version! Live It Up In Your Own Theme Parks With Rollercoasters, Water Slides, Animals and More! Game does not come with as many 'stock' roller coasters, requiring you build your own. Go to a Different Theme Park Every Day! Create your own theme park any day! Engineer rollercoasters and experience the thrills and ills that come with your designs. 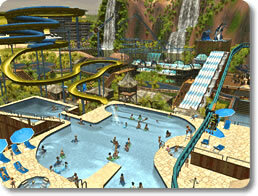 Build water parks and animal exhibits and live the fun life at your very own parks! This awesome package includes Rollercoaster Tycoon 3 and the expansion packs: Soaked! and Wild! to add water parks and animals to your insane roller coaster theme parks. This strategy simulation game is packed with all the excitement of rollercoasters and water slides! Build rollercoasters and more to your heart's desire, but pay attention to the people's needs so you can earn big bucks. If a VIP guest shows up, you get the chance to earn some major money! Build any type of rollercoaster and customize its music, colors, cars and more. Create laser or fireworks shows, whale shows, safaris and much more. Enjoy scenarios of various difficulty levels that ask you to attract a certain number of people to your park, meet a money goal and more, or play sandbox mode to show off your creativity without limits. 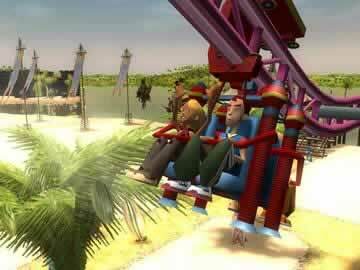 Get away from real life and feel like you're really on a rollercoaster with great features like the Coaster Cam and 3D graphics. Not only will you be having fun, but you'll also build financial strategies by deciding what is most cost effective to build and you'll learn about the physics of building rollercoasters. Experience the heart-pumping thrills of whipping around intense rollercoasters, splashing down water slides and going on safaris with wild animals now all in one place in Rollercoaster Tycoon 3 Platinum! The original RollerCoaster Tycoon which came out in 1999 was received as one of the best games, let alone simulation games, of the decade. Naturally with that hype, sequels of the original are much anticipated and have huge expectations. RollerCoaster Tycoon 3: Platinum (RCT 3) will not let you down. This sequel is action packed and much improved. The graphics are phenomenal, the tutorial is more helpful, the water park feature will win you over, and the overall gameplay and quality is much better. RollerCoaster Tycoon 3 lives up to the hype and is one of the best simulation games on the market. You begin the game by choosing between several game modes and game playing options. You can choose either the “sandbox” mode, which will allow you to create any kind of park you want, the “career” mode, which is a series of challenges, or you can elect to build custom coasters and buildings. In sandbox mode money is no option so you can build and design whatever you want regardless of price. This allows you to create parks even the game developers could not fathom. The next mode, career, is a scenario mode that requires you to turn down-and-out parks into successful enterprises. This is similar to other simulation objective modes in that you are given a certain amount of money and a list of tasks. 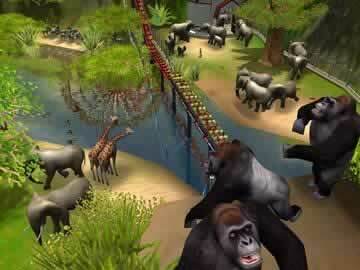 It becomes your job to use the money wisely and build a park, accomplishing each scenario's objectives. The third mode allows you to build custom coasters, fireworks shows, and buildings that can later be imported into each scenario or free play park. This mode gives you the time and opportunity to make coasters without feeling rushed or under the gun, like in the career option. This game stays true to its roots when it comes to gameplay and game mechanics. As a park owner you are in complete control. You can set your parks prices, build rides, hire your own staff, and advertise your park. Like its predecessor you have control of every aspect of the park, however, the controls are easier to use and the graphics and overall enjoyment is much greater. New features of this game that are not in the previous versions are the addition of the water park element as well as the addition of the fireworks show. The fireworks show is especially cool because in it you are able to create vivid light shows accompanied by music of your liking, which can be imported from your computer. This allows you to create shows to your favorite songs or mixes. The graphics are superb and much improved in this sequel. The colors are vivid and the level of detail is impressive. An example of this can be seen with the pools or water in your parks. If you are to click on the water you will see ripples and contrasting shadows. This detail is lifelike and the graphics of this game are some of the best you will come across. The inclusion of the two expansion packs, “soaked” and “wild” is another great perk of this game. These will add to your enjoyment and provide you with hours and hours of added excitement. The only obvious drawback of this game was with adding rides. If ride building is not your specialty, adding coasters to your park can be difficult because there are less “stock” coasters. This requires you to build rides, and though the coaster building is much improved from previous versions, it can still be difficult. If more stock options were available this game would be more playable for a larger group of people. Overall, this game is simply great. RollerCoaster Tycoon 3 is easy to play and the graphics are phenomenal. The new features like the fireworks show builder as well as the water parks are perfect additions to the original version—not departing too far from what makes the game great. Also, the expansion pack additions of “soaked” and “wild” make your investment in this game worth a lot more. The benefits of RCT 3 outweigh the slight difficulty you might face when trying to add pre-built roller coasters. This is one of, if not the best business simulation game on the market and it comes highly recommended. No matter your age or interest in simulation games you will find something about this game that you love. Official Rollercoaster Tycoon 3 trailer from Atari. View some of the roller coasters and other attractions you can build in your theme park.